Cleaning and maintaining your model railroad layout can be a long and painstaking process, especially when it comes to those tight corners and smaller objects. Dust, dirt and grime build up over time, and if you want to keep your layout in tiptop shape without losing your patience, it’s important to find ways to ease the process. It can be particularly difficult to care for your model railroad structures, but over the years we’ve learned a variety of quick little tricks to take the stress out of working with those intricate model railroad structures on our layouts. In this lesson, we teach you an essential tip that will simplify the way you create, clean and work around your model railroad structures. One of the keys to getting the most out of model railroading is to make your job easier whenever you can. There’s no room for stress in a hobby, and that should be especially true for modeling. 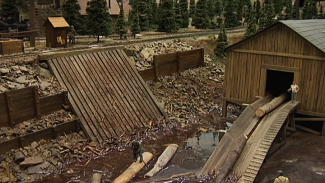 To ease one part of the process, we’re going to show you how to better manipulate and maintain your model railroad structures with one of Bob Hayden’s expert techniques. He and Allen Keller take a closer look at Bob’s layout to discover how he keeps his scenes looking so pristine. Here’s the secret to Bob’s success: rather than working around his model railroad structures, he makes them removable and just works right through them. He teaches you a few different ways to create detachable model railroad structures in order to clean and manipulate your scenes. The biggest benefit to this quick trick is that if you don’t like the placement of your model railroad structures or you want to touch up the details on a certain building, you can easily pull it off and make your adjustments without having to worry about cutting away glue or ruining your scene. See how this expert tip works on your next layout! Is 70 % Alcohol a substitute for Kodak Photo flow to make wet water? Good question, but I don’t know the answer to that one. I use a few drops of liquid soap.